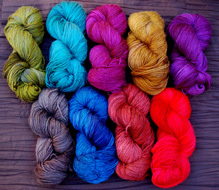 See Dancing Colors yarn and kits now! Dancing Colors now also in Reflections colors! Dancing Colors Hand-dyed yarn is a 45/55% merino/mohair blend. Because each skein of hand-dyed yarn is unique there are no dyelots for these colors; variations between skeins are inevitable and actually add to the beauty of the designs. 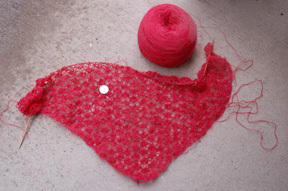 $45 / skein (approximately 490 yds / skein); DK weight ; 5-6 stitches per inch on a size 5 needle. See Reflections Yarn and Kits now! Reflections Hand-dyed yarn is a 3 ply 45/55 merino/mohair blend. Dyed in monocromatic shadings, these yarns highlight the textures and patterns of the designs. There are no dyelots for these colors; variations between skeins are inevitable and actually add to the beauty of the designs. $45 / skein (approximately 325 yds / skein); worsted weight; 3-1/2-4-1/2 stitches per inch on a size 8 needle. Gossamer Hand-dyed yarn lace weight 100% alpaca. Dyed in monocromatic shadings, these yarns highlight the textures and patterns of the designs. There are no dyelots for these colors; variations between skeins are inevitable and actually add to the beauty of the designs. ©2002-2011 Cheryl Oberle Designs, all rights reserved.